Whistling Crafter: Incy Wincy May24th Challenge - Button up!!! Hi again, I keep meaning to do many more cards and every week I find another reason I can't. This week has been so hectic with the charity. But here is my latest creation. 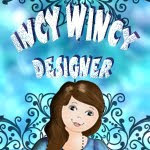 I have done this for the challenge over at Incywincy designs and the challenge is called Button Up!. We all had to use an image from Aspire's Charity Shop (formerly IncyWincy) and make a card or something that incorporates use of a button. So good Luck!! 3d image from. I then looked around at photos of actual stages in the world and found the one I used. I was fantastic due to the many layers. Which by luck was the same as the 3d image. I layered the photo using fireworks and slowly built up the layers using 25ml double sided tape. I then varnished the frame and added a eyelet to mount on the wall. I was going to sell this but Tami(wife) has informed me it is not leaving the house. Thanks to all for looking and goodluck at winning the prize of $10 to spend at Aspire's Charity Shop. Yes I think it is really good. Few improvements to be added, but all in all a really good design for off the top of my head.